SIGN UP as Moola Frenz. (Download "Moola" apps from Apps Store / Play Store / App World). It's FREE. Form a word "M.O.O.L.A" using anything related to LIFESTYLE and take a photo of it. 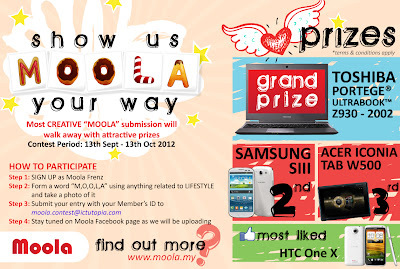 Stay tuned on Moola Facebook page @ www.facebook.com/moolamalaysia as we will be uploading your entry. Visit Moola website for more details. Where's the party is back, mor EPIC than before! Play the game & WIN!